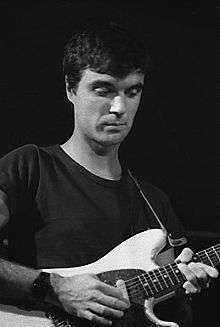 David Byrne (/bɜːrn/; born 14 May 1952) is a Scottish-born American musician who was the founding member, principal songwriter, and lead singer and guitarist of the American new wave band Talking Heads, active between 1975 and 1991. Since then, Byrne has released his own solo recordings and worked with various media including film, photography, opera, fiction, and non-fiction. He has received an Oscar, Grammy, and Golden Globe awards and been inducted into the Rock and Roll Hall of Fame. Byrne is a multi-instrumentalist and is known for his distinctive voice. David Byrne was born in Dumbarton, Scotland, to parents Tom (from Lambhill, Glasgow) and Emma. He is the elder of two children. Two years after his birth, his parents moved to Hamilton, Ontario, Canada, and then to Arbutus, Maryland, in the United States, when he was 8 or 9 years old. His father worked as an electronics engineer. Before high school, Byrne already knew how to play the guitar, accordion, and violin. He was rejected from his middle school's choir because they claimed he was "off-key and too withdrawn". From a young age, he had a strong interest in music. His parents say that he would constantly play his phonograph from age three and he learned how to play the harmonica at age five. In his journals he says, "I was a peculiar young man—borderline Asperger's, I would guess". Byrne graduated from Lansdowne High School in southwest Baltimore County. He started his musical career in a high school band called Revelation, then between 1971 and 1972, he was one half of a duo named Bizadi with Marc Kehoe. Their repertoire consisted mostly of songs such as "April Showers", "96 Tears", "Dancing on the Ceiling", and Frank Sinatra songs. Byrne attended the Rhode Island School of Design (during the 1970–71 term) and the Maryland Institute College of Art (during the 1971–72 term) before dropping out. He returned to Providence in 1973 and formed a band called "The Artistics" with fellow RISD student Chris Frantz. The band dissolved in 1974. Byrne moved to New York in May that year and was joined by Frantz and his girlfriend Tina Weymouth in September. Unable to find a bass player in New York, Frantz and Byrne persuaded Weymouth to learn to play the bass guitar. Byrne gave her lessons. While working day jobs in late 1974, they were contemplating a band. By January 1975, they were practicing and playing together, while still working normal day jobs. They founded the group Talking Heads and had their first gig in June. Byrne quit his day job in May 1976 and the three-piece band signed to Sire records in November. Multi-instrumentalist Jerry Harrison joined the group in 1977. The band released eight studio albums before going into hiatus in 1988. Byrne desired to go solo, but it took three years until 1991 to announce that the band was breaking up. A brief reunion for a single "Sax and Violins" in 1991 occurred before dissolving again. The band was inducted into the Rock and Roll Hall of Fame in 2002, when they reunited to play four tracks, including "Psycho Killer" and "Burning Down the House". Rei Momo (1989) was the first solo album by Byrne after leaving Talking Heads, and features mainly Afro-Cuban, Afro-Hispanic, and Brazilian song styles including popular dances including merengue, Cuban Son, samba, mambo, cumbia, cha-cha-chá, bomba, and charanga. His third solo album, Uh-Oh (1992), featured a brass section and was driven by catchy tracks such as "Girls on My Mind" and "The Cowboy Mambo (Hey Lookit Me Now)". His fourth solo album, titled davidenryb (1994), was a more proper rock record, with Byrne playing most of the instruments on it, leaving percussion for session musicians. "Angels" and "Back in the Box" were the two main singles released from the album. The first one entered the US Modern Rock Tracks chart, reaching No. 24. For his fifth studio effort the emotional Feelings (1997), Byrne employed a brass orchestra called Black Cat Orchestra. His sixth Look into the Eyeball (2001) continued the same musical exploration of Feelings, but was compiled of more upbeat tracks, like those found on Uh-Oh. Grown Backwards (2004), released by Nonesuch Records, used orchestral string arrangements, and includes two operatic arias as well as a rework of X-Press 2 collaboration "Lazy". He also launched a North American and Australian tour with the Tosca Strings. This tour ended with Los Angeles, San Diego and New York shows in August 2005. He has also collaborated with Selena for her 1995 album Dreaming Of You with God's Child (Baila Conmigo) in 1995. His work has been extensively used in movie soundtracks, most notably in collaboration with Ryuichi Sakamoto and Cong Su on Bernardo Bertolucci's The Last Emperor, which won an Academy Award for Best Original Score. In 2004, Lead Us Not into Temptation (music from the film "Young Adam") included tracks and musical experiments from his score to Young Adam. Byrne also wrote, directed, and starred in True Stories, a musical collage of discordant Americana released in 1986, as well as producing most of the film's music. Byrne also directed the documentary Île Aiye and the concert film of his 1992 Latin-tinged tour titled Between the Teeth. He was chiefly responsible for the stage design and choreography of Stop Making Sense in 1984. Byrne added "Loco de Amor" with Celia Cruz to Jonathan Demme's 1986 film Something Wild. Byrne has contributed songs to five AIDS benefit compilation albums produced by the Red Hot Organization: Red Hot + Blue: A Tribute to Cole Porter, Red Hot + Rio, Silencio=Muerte: Red Hot + Latin, Onda Sonora: Red Hot + Lisbon, and Offbeat: A Red Hot Soundtrip. Byrne appeared as a guest vocalist/guitarist for 10,000 Maniacs during their MTV Unplugged concert, though the songs in which he is featured were cut from their following album. One of them, "Let the Mystery Be", appeared as the fourth track on 10,000 Maniacs' CD single "Few and Far Between". Byrne worked with Latin superstar Selena, writing, producing and singing a song ("God's Child (Baila Conmigo)"), included on her last album before her murder, Dreaming of You. Byrne was the host of Sessions at West 54th during its second of three seasons and collaborated with members of Devo and Morcheeba to record the album Feelings in 1997. In 1992 he performed with Richard Thompson. Their joint acoustic concert at St. Ann & The Holy Trinity in Brooklyn Heights, New York on March 24, produced the album An Acoustic Evening which was released the same year. In 2001 a version of Byrne's single "Like Humans Do", edited to remove its drug reference, was selected by Microsoft as the sample music for Windows XP to demonstrate Windows Media Player. In 2002, he co-wrote and provided vocals for a track, "Lazy" by X-Press 2, which reached number 2 in the United Kingdom and number 1 on the US Dance Charts. Byrne said in an interview on BBC Four Sessions coverage of his Union Chapel performance that "Lazy" was number 1 in Syria. The track later featured with orchestral arrangements on his Grown Backwards (2004) album. In 2003, Byrne guest starred as himself on The Simpsons (season 14) episode, Dude, Where's My Ranch?. In the 1970s, Byrne had relationships with Andrea Kovacs and Mary Clarke who had attended the Rhode Island School of Design. He also had a relationship with photographer Lynn Goldsmith in 1980. He had a brief affair with Toni Basil in 1981 and he dated Twyla Tharp between 1981 and 1982. While visiting Japan in 1982, Byrne met costume designer Adelle Lutz whom he married in 1987. They have a daughter, Malu Abeni Valentine Byrne, born in 1989. Byrne and Lutz divorced in 2004. After his divorce, he became romantically involved with art curator and Gagosian Gallery sales director Louise Neri. He also had a relationship with the artist Cindy Sherman from 2007 to 2011. Although a resident of the United States since childhood, Byrne is still a British citizen, but applied for US citizenship in 2012. He lives in New York City. His father, Thomas, died in October 2013. His mother, Emma Byrne, died on 25 June 2014. Byrne is known for his activism in support of increased cycling and for having used a bike as his main means of transport throughout his life, especially cycling around New York. In Los Angeles, Byrne drives a Citroën DS, but in New York he does not own a car. 1 2 Kennedy, Randy (30 May 2008). "David Byrne's New Band, With Architectural Solos". The New York Times. The New York Times Company. Retrieved 30 May 2008. ↑ "Rock's Renaissance Man." TIME Magazine. October 27, 1986 at the Wayback Machine (archived 15 January 2008). Retrieved 11 January 2010. ↑ Indie Rock's Patron Saint Inspires a New Flock – Referencing Bryne's April 15, 2006 journal entry. New York Times, By Will Hermes, January 14, 2007. Retrieved 11 January 2010. ↑ David Byrne Journal: 4.15.06: Military revolt, back pages at the Wayback Machine (archived 14 October 2007). Retrieved 11 January 2010. ↑ Gittins, Ian, Talking Heads: Once in a Lifetime : the Stories Behind Every Song, Hal Leonard Corporation, 2004, p. 140 ISBN 0-634-08033-4, ISBN 978-0-634-08033-3. ↑ Isola, Gregory (March 1997). "Tina Talks Heads, Tom Toms, and How to Succeed at Bass Without Really Trying". Bass Player. Archived from the original on 10 February 2009. Retrieved 15 May 2013. ↑ "2002 Induction Ceremony". The Rock and Roll Hall of Fame and Museum. Retrieved 15 May 2013. ↑ "Tour Dates for David Byrne – Songs of David Byrne and Brian Eno". David Byrne. 4 August 2008. Archived from the original on 22 August 2008. Retrieved 11 January 2010. ↑ Legel, Laremy (23 September 2010). "Review: Wall Street: Money Never Sleeps". Film.com. 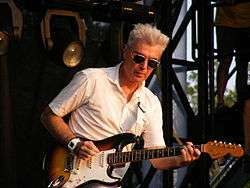 ↑ David Byrne to Provide Promotional Music for Windows XP: "Like Humans Do" to Give Music Fans a Taste of the Digital Music Experience in Windows XP. Retrieved 11 January 2010. ↑ You May Find Yourself On Windows XP – Forbes.com by Davide Dukcevich, August 21, 2001. Retrieved 11 January 2010. ↑ Toronto film festival hit by protest over Tel Aviv strand by Ben Walters, September 07, 2009. Retrieved 11 January 2010. ↑ Thill, Scott (12 May 2008). "David Byrne Converts Building into Giant Instrument". Wired.com. Advance Publications. Archived from the original on 19 May 2008. Retrieved 11 January 2010. ↑ "David Byrne Playing the Building". 8 October 2005. Retrieved 11 January 2010. ↑ Brian Baiker. "A Building for a Song." Newsweek. June 2, 2008 at the Wayback Machine (archived 2 August 2008). Retrieved 11 January 2010. ↑ David Byrne joins Paul Simon on stage in New York at the Wayback Machine (archived 22 June 2008), NME. Retrieved 11 January 2010. ↑ Cragg, Michael (24 May 2011). "Arcade Fire feat David Byrne – Speaking in Tongues". The Guardian. London. ↑ "ANNA CALVI ANNOUNCES 'STRANGE WEATHER' EP, LISTEN TO 'PAPI PACIFY' COVER". Domino. 13 May 2014. Retrieved 13 May 2014. ↑ Sendra, Tim (August 2016). "And the Anonymous Nobody". AllMusic. Retrieved November 23, 2016. ↑ NPR audio interview July 8, 2000. Retrieved 11 June 2010. ↑ "Radio David Byrne". David Byrne.com. Retrieved 11 January 2010. 1 2 Bowman, David (2001). This Must Be the Place: The Adventures of Talking Heads in the 20th Century. New York: HarperCollins. p. 202. ISBN 978-0-380-97846-5. ↑ Sella, Marshall (29 April 2001). "Same as He Ever Was". The New York Times. Retrieved 15 January 2014. ↑ Grant, Richard (16 March 2009). "David Byrne: Stay Hungry". The Daily Telegraph. Retrieved 15 January 2014. ↑ Sandall, Robert (28 February 2004). "How the Talking Head Learnt To Sing from the Heart". The Daily Telegraph. Retrieved 15 January 2014. ↑ Simon Hattenstone (15 January 2011). "Cindy Sherman interview". London: Guardian. Retrieved 2 November 2011. ↑ "David Byrne Can't Vote But Hopes You Will." Rolling Stone. November 04, 2008. Retrieved 11 January 2010. Archived 19 October 2009 at the Wayback Machine. ↑ Byrne's free public e-mail announcement the day prior to the 2012 presidential election, urging Americans to vote, says, among other things, "I tried to get dual citizenship in time for the election, but it didn't work out. I'm actually looking forward to taking the test". David Byrne news [at] davidbyrne.com via campaignmail.topspin.net, Mon, 5 November 2012 at 5:45 PM; subject: Post Sandy / Election Day. ↑ "Bicycle Diaries". davidbyrne.com. Retrieved 20 July 2016. ↑ Tom Schnabel (5 November 2011). "David Byrne & Barry White: What Cars They Drove". KCRW Rhythm Planet. Retrieved 20 July 2016. ↑ Sutter, John D. (1 April 2010). "David Byrne: Song lyrics are overrated". CNN. Retrieved 15 May 2013. ↑ Jonathan Maus (23 July 2009). 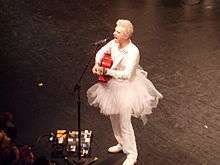 "Rocker/bike activist David Byrne announces Portland event". BikePortland.org. Retrieved 15 May 2013. ↑ Ariel Kaminer. "David Byrne, Cultural Omnivore, Raises Cycling Rack to an Art Form." The New York Times. August 8, 2008. Retrieved 11 January 2010. ↑ "Byrne's bibliography on Byrne's Website". Davidbyrne.com. Retrieved 25 June 2010. ↑ "David Byrne website film listing". Davidbyrne.com. Retrieved 25 June 2010. '"Born Under Punches (The Heat Goes On)"